HAROAH, BECOMING alarmed at the increasing power and numbers of the Israelites in Egypt, ordered that every male child who might be born to them should be cast into the river, and drowned. But the wife of a man named Levi felt that she could not give up her babe, and for three months she hid him. When she could hide him no longer, she prepared a basket of rushes, and coated it with pitch, so that it would float upon the river and keep out the water. 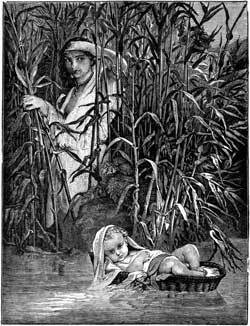 In this ark she placed her infant son, and hid the ark among the flags and bulrushes on the river-bank, and set the child's sister to watch it. Now it happened that the daughter of Pharaoh came with her maidens to bathe in the river; and when she saw the basket she sent one of her maids to fetch it. And when she looked at the child he wept, and she had compassion for him, and said, "This is one of the Hebrews' children." Then the child's sister came forward and said to Pharaoh's daughter, "Shall I call to thee a Hebrew woman that she may nurse the child for thee?" And when the princess said, "Go!" she, the maid, went and called her own mother, to whom Pharaoh's daughter said, "Take this child and nurse him for me, and I will give thee thy wages." And the woman took the child and nursed him. And when he had grown, his mother took him to the princess, who adopted him as her son, and called his name Moses, which means drawn out, because she took him from the water. Afterwards he grew to be a great man: he was learned in all the wisdom of the Egyptians; and we are told, "he was mighty in words and deeds."